It’s been seven years since the inventive and audacious film adaptation of Frank Miller and Lynn Varley’s comic book series 300 dazzled audiences with its hyper-stylised, ultra-violent and bloodthirsty take on Greek history. Its director, Zack Snyder, has moved on to decidedly bigger ventures, leaving first time director Noam Murro to take the directorial reigns of 300: Rise Of An Empire, a sequel that’s tedious, repetitive and ultimately hideous on the eyes. The narrative of this sequel-of-sorts is a muddled mess, overloaded with unnecessary exposition, including Xerses’ half-hearted transition from man to God. 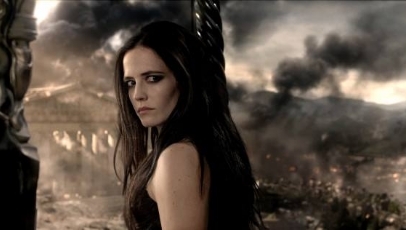 The main crux, however, concerns the sea-based battle between the Greek’s, led by Themistocles (Sullivan Stapleton), and the Persians, led by Xerses’ right-hand woman Artemisia (Eva Green), in the straits of Piraeus and Salamis, off the coast of Athens. It’s mindless, chaotic, incomprehensible drivel that pales massively in comparison to its predecessor, which at least had some kind of method and refinement to its madness. More than anything else, the film feels more like a scene-for-scene do-over than its own entity, only this time with numbing visuals, one-dimensional characters (Jack O’Connell, a fine actor, is reduced to the background) and boorish, inept direction that renders the action sequences tiresome. The fact that the film has been post-converted in 3D doesn’t help matters in the slightest, and audiences are more likely to leave the cinema with dreadful headaches than even the slightest sense of satisfaction. For all 300: Rise Of An Empire attempts to cover, which is in fact what weighs it down so much (even in spite of its rather short 102 minute run time), its one salvation is by far Green’s decidedly wicked performance as Artemisia.